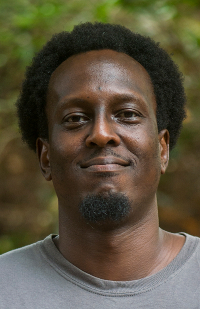 Dayo Ntwari, a Rwandan-Nigerian writer, has been a fan of science fiction and fantasy since childhood. He enjoys writing stories inspired by African legends and myths. He believes Africa’s diverse histories, religions, spirituality and mythologies can serve as a never-ending treasure trove of inspiration for African science fiction and fantasy. Dayo Ntwari was born in Karlsruhe, Germany, where he spent the first five years of his childhood, and then grew up in Lagos, Nigeria. After secondary school in Nigeria, Dayo went back to Germany for a Computer Science degree in Hamburg. Today he lives with his wife in Kigali, Rwanda, where he is currently working on his first novel. He also hopes to publish a collection of his short stories.